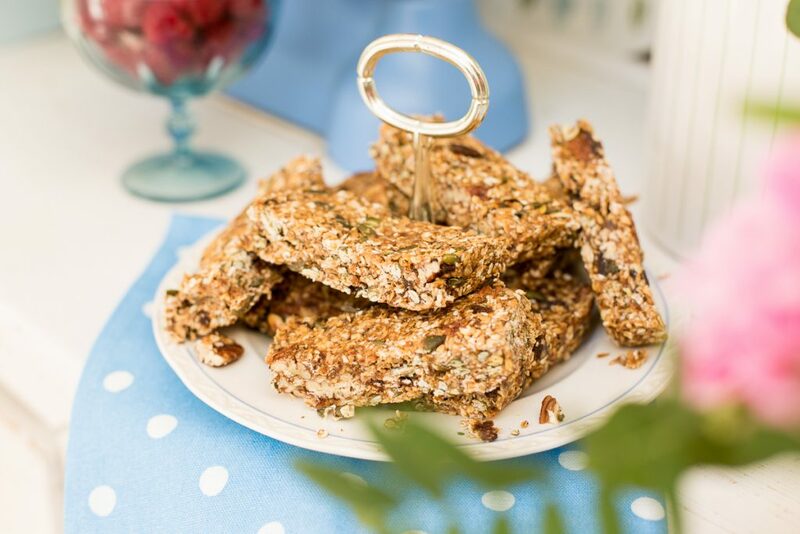 These granola bars are held together with peanut butter, puréed dates and maple syrup, and are surprisingly sturdy considering they are not baked. You can use almond or cashew nut butter in place of peanut butter if you prefer, and try honey or agave nectar instead of maple syrup. These are vegan-friendly (except if you use honey) and suitable for coeliacs if you choose gluten-free oats. Check out the video I made in collaboration with I Love Cooking for my how-to make this recipe. Toast the oats, pecan nuts, pumpkin and sesame seeds together in a large dry frying pan over a medium heat until golden brown, tossing regularly. Tip them into a large bowl and toss together with the raisins, linseeds and cinnamon. Spoon the mixture into the prepared tin, spreading it out evenly with the back of a spoon. Cover with cling film and chill in the fridge for 1-2 hours until set firm.